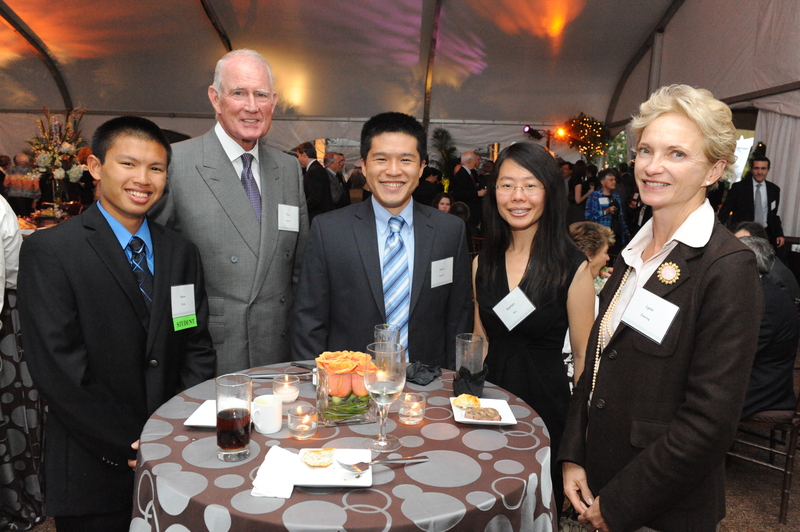 L-R: Atom Zerfas, Tony Deering, Kevin Yang '07, Katelyn Niu '05, and Lynn Deering celebrate the end of UMBC's Exceptional by Example Campaign. Junior Atom Zerfas is the quintessential UMBC scholarship student: overwhelmingly outgoing and incredibly involved. A double major in psychology and math, Zerfas is no slouch where academics are concerned — but he feels just as much at home on the playing field. Zerfas came to UMBC following his graduation from Pikesville High School in 2009. Immediately he jumped into the UMBC culture, joining the Student Events Board and Ultimate Frisbee team. In just two years, he became the Ultimate Frisbee president. “Don’t get me wrong, I’m just the president, I’m not the captain,” he explained modestly. Atom knew one thing leaving high school: he wanted to be a teacher. After looking around at potential schools, he found UMBC and the Sherman STEM Teacher Education Program. The program helped Zerfas set up a five-year plan in which he will earn an accelerated master’s in education. The Sherman program requires its students to participate in a service project every year. Through the program, Atom was placed in Cherry Hill Elementary/Middle School, where he realized that he wanted to be a middle school teacher. The support he’s received from the Sherman STEM Teacher Education Program— financially, academically, and morally — has shaped Atom’s UMBC experience. He has been a part of a close-knit cohort of nine scholarship students and has even been able to meet the scholarship’s namesakes, George and Betsy Sherman, who are always open to giving great advice and encouragement, he said.